Hey dolls! 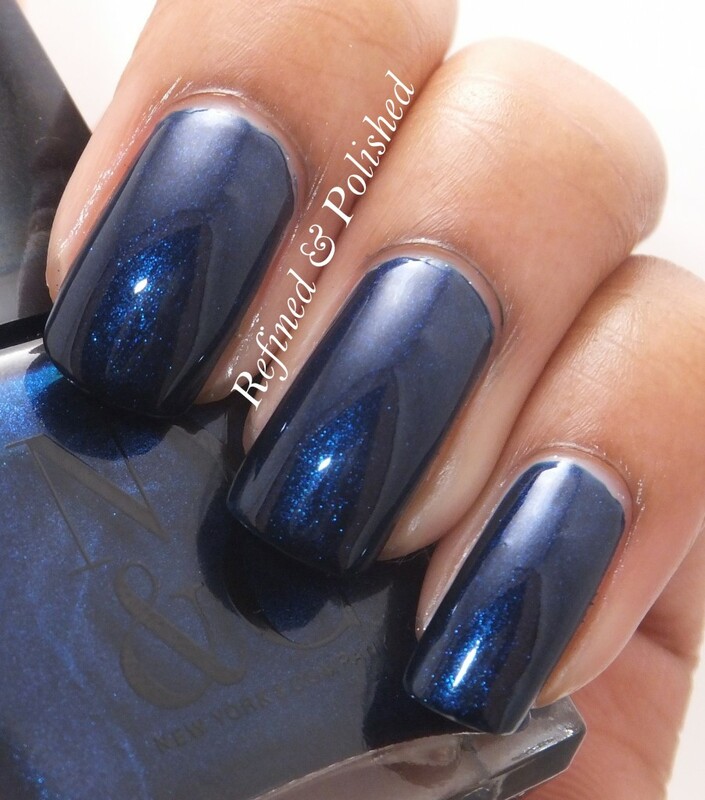 Today I have photos for you of another blue polish in support of autism awareness. A speech-language pathologist is one of the team of professionals who may work with a child who has autism. Our national organization, the American Speech Language and Hearing Association, has some great information on the types of services a slp can provide here. Late last year I found out that NY & Company, one of my most favorite clothing stores, was releasing polishes. Naturally, I had to pick up several of the shades because of the price ($5.95 each or two for $10). Oceanic, a deep blue shimmer, is the first one I tried. The formula was a little thin, but not runny. The brush was thin, long, and spread easily on the nail. Two coats of Oceanic were used for opacity. I had a horrible smudge on my index finger, which I was too lazy to fix, hence only three fingers seen below. Oceanic, while not extremely unique, is a pretty blue shimmer. For the price and formula, it’s worth checking out if you don’t have anything similar already. My hubby, knowing that I love NYCO, picked up several polishes for me along with a gift card last Christmas. He knows the colors I like so well, that he picked up Oceanic too. Yes, that means I have an extra bottle! If you’d like to give Oceanic a try, see the details below.